Every year on January 15, the Pauline Fathers & Brothers around the world celebrate a feast in honor of its patron saint, Paul the First Hermit. On this occasion, the monks participated in a Novena, singing hymns together in honor of Saint Paul. In the American Province, these celebrations are also an opportunity for all the Fathers & Brothers from different parishes and monasteries in USA, to meet together. 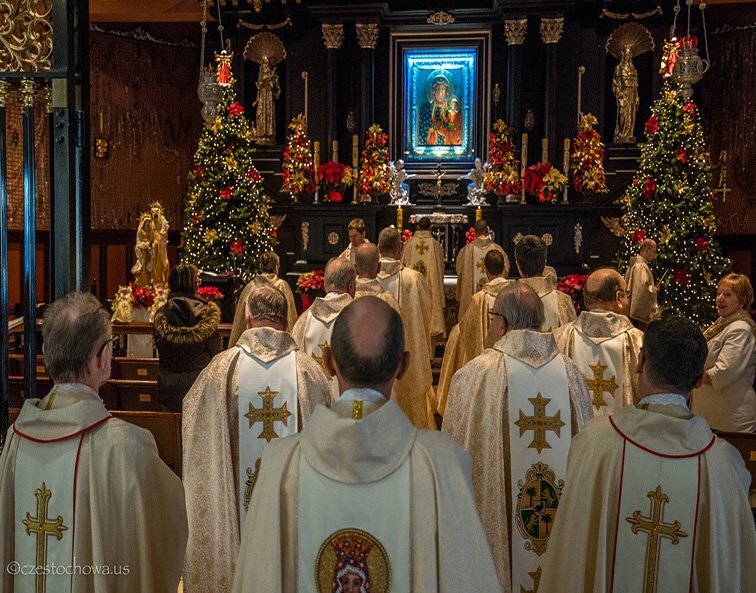 The meeting of the whole province took place on January 14-16 at the monastery in Doylestown, at the Shrine of Our Lady of Czestochowa. Participants of this meeting came from various Pauline houses: Harwood Heights (Illinois), Manhattan (New York), Yonkers (New York), Buffalo (New York), Rockville (Connecticut), Summerfield (Florida), Kittaning (Pennsylvania). A special guest invited to this year’s meeting was Father Mariusz Tabulski, Member of the General Council of the Order from Czestochowa, Poland. Father Mariusz led a day of recollection for all the religious on Monday, January 14, giving spiritual conferences and sharing his religious and pastoral experience. On Tuesday, Father Mariusz also led a meeting about the Coronation of the Icon of Our Lady of Czestochowa. The purpose of the meeting was to prepare the American Province in a pastoral way for the Coronation. The Coronation of the Icon of Mary, which has been blessed and signed by John Paul II and currently is in the lower chapel of the Shrine, will take place on August 25, 2019. Archbishop Charles Chaput of Philadelphia will be the one crowning the Image. The most important moment of the Pauline celebrations was the solemn Holy Mass at 11:30 am, celebrated by all the Fathers in the Chapel of the Blessed Mother. Father Tadeusz Lizinczyk, the the Provincial of the Order in USA, was the main celebrant and gave a homily to all the faithful and all the monks. During the Mass, just like every year, all the Fathers and Brothers renewed their religious vows of obedience, chastity and poverty. The next day, on January 16, the community celebrated one more liturgical feast – Our Lady Queen of Hermits and Mother of the Order. On that day, all the monks gathered in the monastery chapel for the Eucharist, presided by Fr. Mariusz Tabulski. During the Mass they all renewed their covenant with Mary. The annual meeting of Pauline Fathers and Brothers of the American Province in Doylestown was a time of community prayer, meditation, but also it was a great opportunity for mutual joy and meeting in a fraternal community.